Symphonies: No. 2 (1953) [29�31]; No. 3 (1956) [32�48]; No. 5, �Hydriotaphia� (1973) [14�55]. 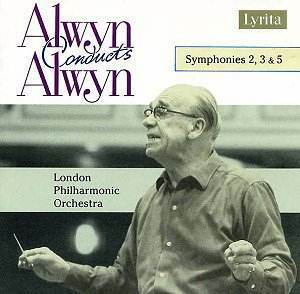 Alwyn the symphonist represents the serious side of this composer. These works are cogently argued, impressive musical statements, arguably showing the very best of this under-rated composer. These particular Lyrita recordings, of course, have the composer�s own special authority and as such should be seen as invaluable documents. The Second Symphony is in two parts. William Mann�s thorough booklet notes trace the work�s motivic workings. The dynamic first part is fairly challenging (not really what I had expected from this composer, and a pleasant surprise) � the performance is simply superb. The second part is dark and shadowy. There is some lovely delicate woodwind scoring around 13�24 � the LPO�s players play in a marvellously hushed, mysterious way for the composer. The musical argument throughout is cogent. The Third Symphony was commissioned by the BBC (and dedicated to its then controller of music, Richard Howgill). It begins in an altogether brighter fashion than its predecessor before letting in an archetypically Romantic, aching lyricism that eventually takes over the final pages of the first movement in memorable fashion. The ghost of Sibelius hangs heavily over this work at times. Hans Keller called this a �tonal 12-note work�, the first movement being based on an eight-note set, the remaining notes of the total chromatic surfacing in a four-mote figure that occurs in the second movement. But this is not in any way Schoenbergian dodecaphony � the tonal processes utilised by Alwyn are still firmly directional, and the ear is led towards the composer�s structural goals. The ruminative �Poco adagio� is really quite a deep statement, its ever-shifting scoring a delight; in stark contrast, the finale is rather war-like (certainly filmic in its gestures). It cannot shake off the dogged rhythmic determination with the result that when it subsequently tries to scamper along, it does so with a disconcerting ominous undertone. The concentrated Fifth Symphony is the most impressive achievement on this disc. Commissioned by the Arts Council for the 1973 Norwich Triennial Festival, it is dedicated, �to the immortal memory of Sir Thomas Browne (1605-1682)�. Browne�s elegy on death appeared in 1658 under the title �Hydriotaphia: urn burial, or a discourse of the sepulchral urns lately found in Norfolk� � Alwyn prefaces each section of his symphony with a quotation. Although in one long movement, there are distinct sections that correspond to the traditional symphonic layout. The work�s strength lies in its brevity, for Alwyn concentrates his ideas � and his emotional weight � in a total time-span of just under a quarter of an hour. Altogether this is an eminently worthwhile disc and the perfect complement to the disc of shorter, lighter works on SRCD229 ()http://www.musicweb-international.com/classrev/2004/Feb04/Alwyn_miniatures.htm).